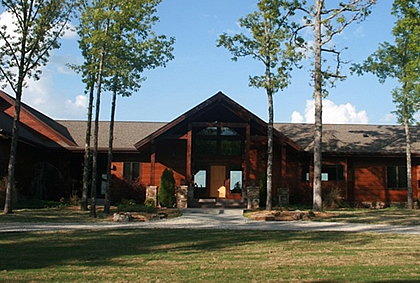 The White River Inn is a custom designed lodge built of coastal Western Red Cedar logs on a magnicificent bluff 300 feet above the White River near Cotter, Arkansas. This property is a perfect fit for fly fishing enthusiasts, sporting fanatics, couples on a romantic holiday, vacations and travelers looking for an idyllic, quiet getaway. A full day of fishing for trophy trout on the White River ** Price and Guide Service to be determined at time of booking. *You must reference this Stay n Play or Fish N Chip Package when making reservations.